EuroFour is a dynamic sales organisation for manufacturers of products for both personal as domestic care. Major European manufacturers have put their faith in EuroFour to represent them, and their products, in the Dutch and Belgium retail market. EuroFour deals with various retail outlets such as drugstores, supermarkets and department stores. A well-balanced range of products, the right pricing and professional promotional support ensure a good sell. In addition, the business partners of EuroFour can count on reliable deliveries thanks to the well-organized logistics process. Many of the product categories in which EuroFour is active can be produced and supplied under retailers’ own brand. In addition to competitive pricing, EuroFour can also take care of the packaging design. Please contact us if you have a question! EuroFour was founded in 1995. An ambitious staff works at the fully equipped Zwijndrecht home base. 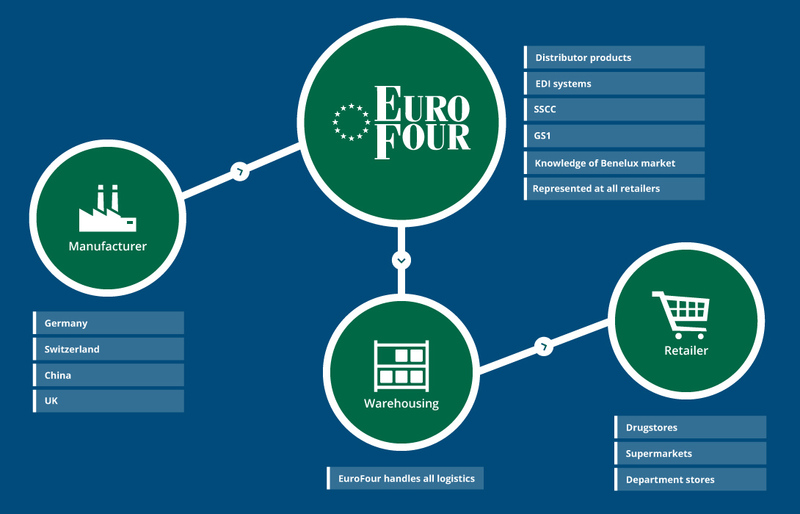 EuroFour works for several European manufacturers, but also has their own successful products under the EF brand. EuroFour is adapted to process orders from retailers via EDI modern technology and a highly flexible logistics process quickly and efficiently. EuroFour supervised the complete development of your Private Label.